The Gee’s Bend Quilters have gained national and international acclaim for their work in carrying on the domestic tradition, now considered an artistic tradition, of quilt making. Gee’s Bend is a small community located in Wilcox County near Selma, Alabama. The community was founded by the Gee family in the 19th century and later became a plantation maintained by more than a hundred slaves. Gee’s Bend is now home to a small citizenry of African Americans who trace their roots there back through six generations. The ladies who have become known for their quilts are part of that heritage. Quilters from Gee’s Bend were first recognized nationally during the late 1960s when an article about an early economic collective known as the Freedom Quilting Bee appeared in the New Yorker magazine. 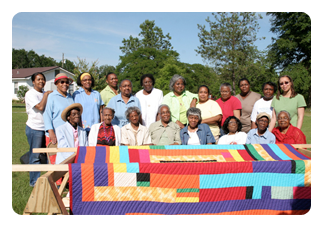 The Freedom Quilting Bee grew out of the quilting tradition of the Gee’s Bend area and the involvement of some of the quilters in the Civil Rights Movement. Gee’s Bend quilters’ work rose to further prominence in the 1980s when cultural and economic organizations began to recognize and market Gee’s Bend and its quilters, eventually garnering commercial contracts for quilters. For the women of Gee’s Bend, quilting always provided a means of expressing themselves while providing needed warmth for their families. Older quilters trained younger women, passing the tradition across generations. Today, many of the quilts and their stories have become part of what is called the Gee’s Bend Quilter’s Collection. The quilters’ masterpieces are in great demand and have developed a worldwide market of collectors. In recent years, members of the Quilters have traveled nationwide to talk about Gee’s Bend’s history and their art. Many of the ladies have become well known for their wit, engaging personality and, in some cases, singing abilities. In 2003, fifty living quilters in this artistic community founded the Gee’s Bend Quilters’ Collective, the exclusive marketing outlet for their creations. The women of the community own and operate the Collective. Their efforts have helped to revive what was once a dying community. The Gee’s Bend quilts have been shown in prominent museums including the Museum of Fine Arts in Houston, the Philadelphia Museum of Art, the Whitney Museum in New York, and the Smithsonian. In 2006, the U.S. Postal Service honored the quilt makers’ work and tradition by issuing a sheet of ten commemorative stamps bearing images of striking Gee’s Bend quilts.